Steven Spielberg says no film has affected him the way "Schindler's List" did. 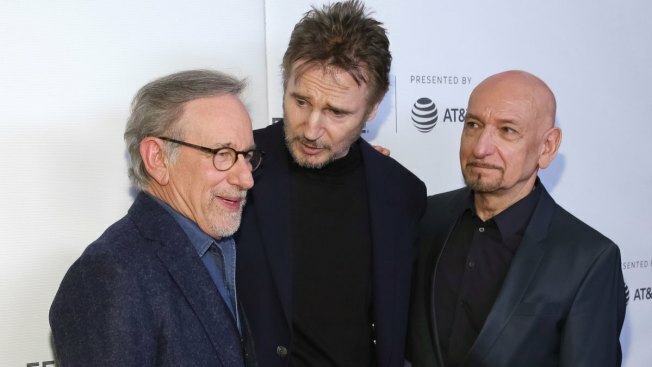 Spielberg, Liam Neeson, Ben Kingsley and others reunited for a 25th-anniversary screening of "Schindler's List" at the Tribeca Film Festival on Thursday, in an evening that had obvious meaning to Spielberg and the hushed, awed crowd that packed New York's Beacon Theater. In a Q&A following the film, Spielberg said it was the first time he had watched "Schindler's List" with an audience since it was released in 1993. "I have never felt since 'Schindler's List' the kind of pride and satisfaction and sense of real, meaningful accomplishment — I haven't felt that in any film post-Schindler's List,'" Spielberg said. The reunion was a chance for Spielberg and the cast to reflect on the singular experience of making an acknowledged masterwork that time has done little to dull the horror of, nor its necessity. "It feels like five years ago," Spielberg said of making the film. "Schindler's List," made for just $22 million (Spielberg declined a paycheck), grossed $321 million worldwide and won seven Academy Awards, including best picture and best director. It also did much to educate the American public on the Holocaust. After the film, Spielberg established the Shoah Foundation, which took the testimony of 52,000 Holocaust survivors. Making "Schindler's List" was a profound, emotional and fraught experience for many of those involved. Kingsley recalled confronting a man for anti-Semitism during production. Spielberg said swastikas were sometimes painted overnight. Recreating scenes like those in the Krakow ghetto and at Auschwitz were, Spielberg said, very difficult for most of those involved. Two young Israeli actors, he said, had breakdowns after shooting a shower scene at the concentration camp. "That aesthetic distance we always talk about between audience and experience? That was gone. And that was trauma," said Spielberg. "There was trauma everywhere. And we captured the trauma. You can't fake that. (The scene) where everyone takes off their clothes was probably the most traumatic day of my entire career — having to see what it meant to strip down to nothing and then completely imagine this could be your last day on earth. "There were whole sections that go beyond anything I've ever experienced or seen people in front of the camera experience," the 71-year-old filmmaker added. Spielberg actually released two movies in 1993. "Jurassic Park" came out in June, and "Schindler's List" followed in November. While he was shooting in Poland, Spielberg made several weekly satellite phone calls with the special effects house Industrial Light & Magic to go over Tyrannosaurus Rex shots — a distraction he abhorred. But Spielberg initially shied away from "Schindler's List," scripted by Steven Zaillian and based on Thomas Keneally's novel "Schindler's Ark." He urged Roman Polanski, whose mother was killed at Auschwitz, to make it. Martin Scorsese was once attached to direct. Yet the making of "Schindler's List" prompted an awakening for Spielberg, who has said his "Jewish life came pouring back into my heart." On Thursday, the director said he wanted to make the film about "the banality of the deepest evil" and "stay on the march to murder, itself." To keep his sanity while shooting in Poland, he watched "Saturday Night Live" on Betamax and relied on weekly calls from Robin Williams.